ONE&ONLY CAPE TOWN is gearing up for the festive season with an exciting programme of Christmas activities and a choice of elaborate menus for celebratory lunches and dinners in its two signature restaurants, Reuben’s and Nobu. Offering a memorable setting in the heart of the V&A Waterfront, the One&Only will be ‘dressing up’ its public spaces to surprise, delight and entertain its many local and international guests this festive season. The chosen theme is the popular Nutcracker ballet story, and this will be carried through in exquisite decorative details throughout the resort. ‘Guests will be flying into Cape Town from all over the world, which is why we decided to choose a Christmas theme with universal appeal and a much-loved story line,’ explains Julie Killias, the highly experienced PR and event coordinator commissioned by the One&Only to bring the joy and excitement of Christmas to life, inspired by the story of the Nutcracker. Traditionally performed as a ballet all over the world at Christmastime, it’s the story of a young girl called Clara who is given a nutcracker in the shape of a large wooden soldier by her godfather, a toymaker, on Christmas Eve. That night, Clara falls asleep clutching her beloved nutcracker soldier and has a vivid dream in which nothing is as it seems. She embarks on a strange and wonderful adventure to exotic lands, including the Land of Sweets – the stuff of childhood fantasy – where she meets the sugar plum fairy and a host of dancing sweets and dainty confections. Starting on 16 December, One&Only’s now famous Afternoon Tea buffet in the Vista Lounge will be transformed into a veritable feast straight out of the Land of Sweets. Beautifully decorated cakes, cupcakes festooned with stars, luscious fruit tarts, strawberry pink meringues, chewy Florentines, traditional European Christmas cookies, macaroons in sherbet hues and cream scones will all feature on the buffet, along with enormous bowls of fresh berries, candied almonds, chocolates and a collection of old-fashioned sweets, including nougat, fondant and fudge. And if all that sweetness gets too much, there will also be plenty of savoury delights to feast on, from dainty sandwiches to bite-sized chicken pies. Included in the price of R145 per person is unlimited speciality teas and coffees. Reservations for the ‘Land of Sweets’ Afternoon Tea buffet are highly recommended, as are early bookings for Festive Year End functions and parties, Christmas Eve dinner, Christmas Day lunch and the various New Year’s Eve celebrations taking place in the resort. Offering exceptional service, a wonderful ambience and world-class cuisine matched to an impressive wine cellar, One&Only Cape Town is a clever choice for exclusive Festive Year End functions and parties that will make friends and colleagues feel very spoilt. Choose from three-course set menus priced from as little as R255 per person or buffet menus from R295 per person. 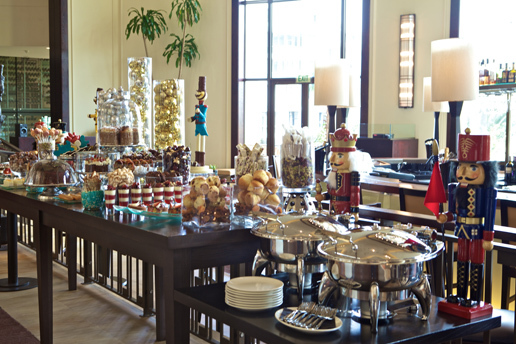 Reuben’s will be hosting a magnificent buffet on Christmas Eve and Christmas Day, featuring more than a dozen starters such as house-cured salmon gravadlax with potato blini and horseradish crème fraiche; fresh West Coast oysters; and foie gras and chicken liver parfait with apple chutney and melba toast. A few of the ‘main events’ on the buffet will be traditional honey glazed ham with three mustards, roast turkey with all the trimmings; stuffed pork belly with apple and vanilla sauce; and pepper-crusted sirloin with Yorkshire pudding. For dessert, guests will be spoilt for choice with the likes of Cape brandy pudding with crème anglaise; blueberry and sherry trifle; pavlova with fresh seasonal berries; and, of course, a selection of local cheeses with preserves. The cost for these two special buffets is R675 per person for dinner, and R695 for lunch (R125 for 7-12 years, and R400 for teens 13-17 years). One of the highlights of Christmas at the One&Only this year will be a special tree-lighting ceremony followed by Carols by Candlelight. A focal point of the celebrations will be five-metre tall Christmas trees adorned with hundreds of sparkly Christmas baubles handmade by the Lalela Project, a Cape Town organisation focused on empowering local disadvantaged youth through the arts. Guest may also purchase these handcrafted Christmas baubles, with all proceeds benefiting the Lalela Project. Celebrate New Year’s Eve in glamorous style at Nobu, with a beautifully executed set menu showcasing some of the famous Japanese chef’s signature dishes and a complimentary glass of bubbly, all for R2100 per person. Or ring in the New Year at Reuben’s, with a sophisticated set menu featuring langoustine, salmon, duck, milk-fed veal and strawberries and a glass of bubbly for R1500 per person.